The pâte-de-verre technique that Liuli uses involves a complex twelve-step process per creation. Each step must be performed without error to prevent breakage, irregular air pockets or impurities. Pâte-de-verre, therefore, makes each piece of Liuli's creations one of a kind. The work of art is colored by the addition of metallic oxide prior to the firing process. Because these colors are created under extreme heat during the manual process of pâte-de-verre, they will never fade and will not be the exact same as each other, nor as those seen in the product photos. 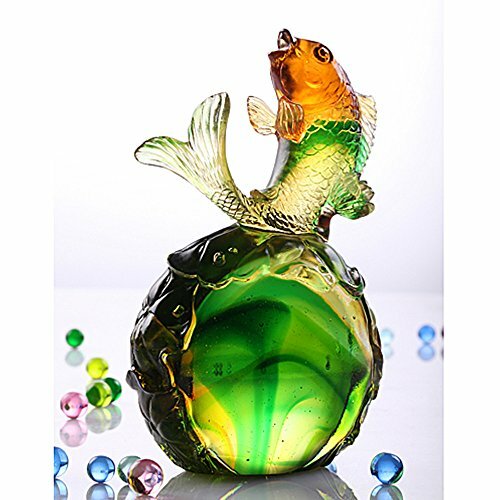 That is the unique trait of pâte-de-verre, and the value behind collecting original Liuli creations. LIULI was established in Tamshui, Taiwan in 1987 as Asia's first Liuli workshop and stands today as Asia's largest Liuli arts brand. LIULI operates 70 galleries around the world. 2008 brought the first two stateside galleries in San Francisco and New York. Presented in a gift box with a signature-printed gift bag. If you have any questions about this product by LIULI Crystal Art, contact us by completing and submitting the form below. If you are looking for a specif part number, please include it with your message.